If you have decided to give your home´s exterior a makeover, we would first recommend you to replace your siding. Now, when you plan to replace your siding, you should also think about replacing your windows at the same time. After all, your objective is to ensure that the aesthetics and visual appearance of your home all work well together to achieve the right effect. So, the question arises—should you replace your windows at the same time as your siding? If you’ve done the math, then you know it could be a good way to kill two birds with one stone. Basically, if you replace your windows and siding together, it enables your contractor to accurately fix the capping around the window before he or she takes care of the siding. Capping around the window is a very important task as this particular framing helps direct the water away from the frame and the interior of your walls. If you replace both the siding and windows at the same time, your contractor will be able to set the windows and then install the siding. And that can help you save a lot of money in the long run. Of course, it is entirely possible for you to either replace your windows or siding first. Both projects can be done independently of each other. However, ideally, you should do them at the same time. Now, when most contractors work simultaneously on both the projects, they usually put the windows in before adding the siding. Doing so allows them to set the windows into place, letting them accurately fix the capping around the window before they turn their attention to siding. How Can Your Siding Be Affected By Window Capping? Contractors commonly add a barrier to moisture beneath the window frame, which extends below the siding, too. If your contractor has to install the siding prior to replacing the windows, he or she may need to cut into your new siding to put that barrier in place. While that doesn´t necessarily rule out doing things in the standard order, it is definitely not the perfect situation. It is not ideal to redo the siding; redoing even a small part of the siding could destroy its appearance. Or, in the worst case, it could play a role in adding to the cost of your window installation. In addition to that, your original windows´ capping will also most likely sustain damage when the siding is removed, prompting your contractor to recap your windows immediately, whether they are new ones or not. So, what does this mean? You´d have to pay extra to have the windows recapped twice if you choose to do your siding first and wait to replace the windows. If you replace your windows at the same time as your siding, the capping can be done when the windows are being replaced, saving you a lot of money. Of course, we completely understand if you are not in a financial position to replace both your windows and siding at the same. After all, swapping out all the windows and siding in a typical three-bedroom home can set you back $10,000 or even more. That’s definitely not in the scope of everyone’s renovation budget. If you have to prioritize these projects, we would highly recommend that you replace your windows first. 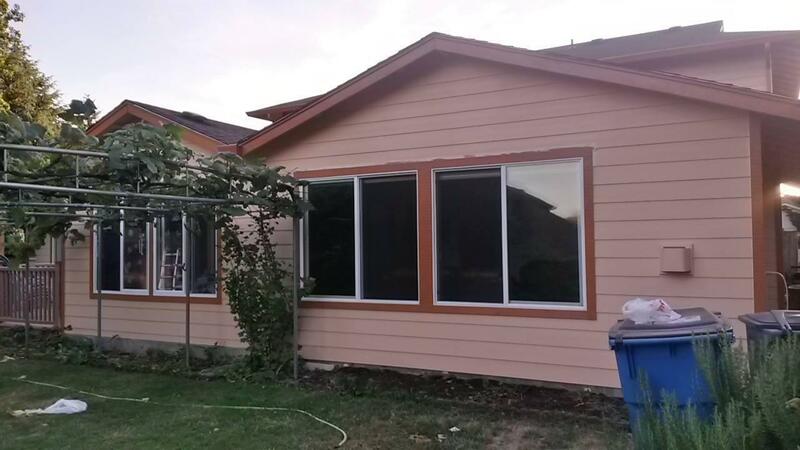 In most cases, the contractors will add the new windows before adding siding anyway. Thus, when you replace your windows first, you´ll be following the order professionals prefer anyway. When Should You Replace Your Siding Before Your Windows? If your siding is running on its last legs and your exterior walls are currently vulnerable to insects and moisture, it makes sense to focus on replacing it first. If there are pieces of siding pulling off the frame or humongous holes in the boards, you should get the issues settled immediately. Small issues when left unaddressed can lead to bigger problems. You don’t want to aggravate any underlying issues. Some of the issues that can arise because of worn-out siding can include skyrocketing energy costs, leaks in your home´s interior, and rotting boards. Therefore, it is in your best interest to resolve the problems as soon as possible. What Are The Benefits Of Replacing Both At The Same Time? 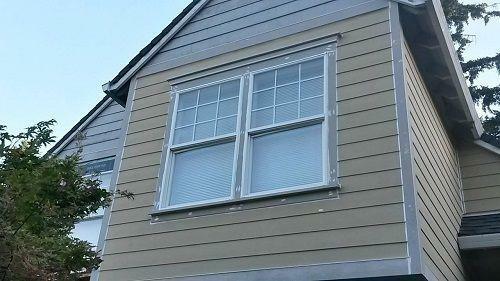 You can derive several benefits from replacing both siding and windows at the same time. One particular benefit that stands out is undoubtedly your home´s ability to save energy. Basically, your home will be energy-efficient if you replace both the windows and siding at the same time. Both the windows and siding can affect the home´s energy profile. For instance, if your windows are drafty, the conditioned air in your home will be allowed to escape from the frames and joints. However, it wouldn’t make much sense to replace your windows with energy-efficient low-E glass windows only to have air and moisture entering and exiting your home through cracks in your siding. That´s why it is considered ideal to replace both the siding and windows at the same. 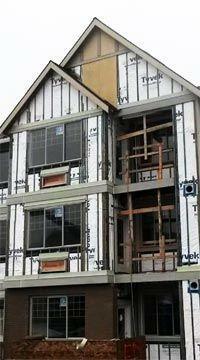 Another benefit to replacing siding is that the process gives you an opportunity to improve your home´s insulation. When you remove your old, ragged siding, you have the opportunity of replacing or adding insulation, thereby increasing the energy efficiency of your home. A house-wrap can also be put in place before the new siding goes up. House-wraps are sheets of synthetic material that create a barrier between the inside of exterior walls and the outdoor elements. It’s lower in weight and therefore easier to install than traditional asphalt saturated felt. In addition to that, the removal of old siding also enables the contractors to repair the various kinds of structural damage caused by several factors such as leaks and dry rot from the outside without the mess, hassle, and extra expense caused by disturbing your home´s interior.